3. Which pair of organisms is likely to engage in interspecific resource competition? 7. Which of the following is considered a biotic factor capable of influencing a plant species's population growth? 8. A lake filled with algae that are choking out aquatic plants and fish is likely experiencing which process? 9. In a tropical food web, 800,000 kJ of energy are produced by autotrophic species. Approximately how much energy will exist at the level of secondary consumers? 10. Nitrogen-fixing bacteria are most likely found in which environment? 11. Plants that inhabit warm, dry environments have evolved which of the following adaptations? 12. A grassy field experiences an increase in growth in an area where phosphorus has been added. However, no such growth occurs in a second area to which nitrogen has been added. Which is a limiting nutrient for this ecosystem? 13. Ecologists measured the evapotranspiration and net primary production of different ecosystem types. Their results are shown in the graph. 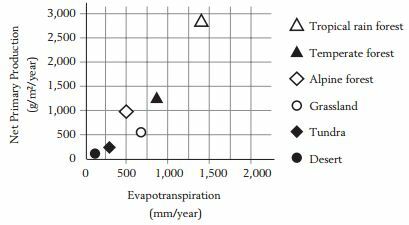 How many ecosystem types have a higher rate of evapotranspiration than grassland? 14. Ecologists measured the evapotranspiration and net primary production of different ecosystem types. Their results are shown in the graph. How much plant biomass is added to a square meter of temperate forest in one month? 15. Ecologists measured the evapotranspiration and net primary production of different ecosystem types. Their results are shown in the graph. Which factor leads to a higher rate of net primary production? 16. Ecologists measured the evapotranspiration and net primary production of different ecosystem types. Their results are shown in the graph. According to the chart, which best describes the relationship between solar energy and net primary production? A. Solar energy is unrelated to net primary production. B. Solar energy is positively correlated with net primary production. C. Solar energy is negatively correlated with net primary production. D. Solar energy increases net primary production where water is not limited. E. Solar energy increases net primary production by increasing evapotranspiration. 17. Ecologists measured the evapotranspiration and net primary production of different ecosystem types. Their results are shown in the graph. The graph shows net primary production. Based on the data, which biome could potentially have a gross primary production rate equivalent to 500 grams per square meter per year? 18. In a long-running ecological study, the species richness of mosses, shrubs, and trees was calculated for one hectare (10,000 m2) of land every 50 years for 200 years. The data are shown in the table. What ecological process do the data suggest is occurring? 19. In a long-running ecological study, the species richness of mosses, shrubs, and trees was calculated for one hectare (10,000 m2) of land every 50 years for 200 years. The data are shown in the table. During which time period do the data suggest this area may have experienced a natural disaster? 20. In a long-running ecological study, the species richness of mosses, shrubs, and trees was calculated for one hectare (10,000 m2) of land every 50 years for 200 years. The data are shown in the table. According to the data, has this community reached a climax? A. Yes; all densities continue to change. B. No; there is continual change in species' densities. C. Yes; moss species are constantly present throughout time. D. No; moss species are always present in high densities. E. Yes; in 1800 there are relatively many more tree species found.